Flash fiction, just like any kind of fiction, uses this process for narrative. I am a self-styled expert in many things… educating myself via the internet, for one thing and how to conduct endless research on different dieting and fitness methods without ever actually applying them consistently to self for another thing. A story needs a beginning, a middle and an end. 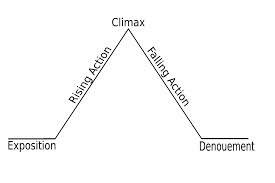 Very obvious yes, but the beginning should scene set (exposition), the middle describe a mini climax (rising action and falling action) and the end bring it all together. The end does not need to tie up all loose ends; it could leave the reader thinking – and wanting more. Sometimes, the first line is enough to think up in the first place without a clear idea of where the story is going. Take for example – ‘Molly’s latest boyfriend hadn’t specified at the beginning that he was a volunteer traffic warden and it was beginning to become a problem.‘ There are a lot of places you could go with this one line – the problems of being a volunteer traffic warden, or how to get rid of a dull boyfriend in murderous ways, for example. Excess words don’t have a place in flash fiction – you will need to ensure you have plenty of words to use so you can contrast descriptions, adjectives and adverbs, and then discard what you don’t need. It’s easier to write flash fiction if you write it all out, then check the word count and then start to pare back the words. Visualise the overall length at the beginning to help guide you – I’ve been writing 100-word flash fiction for seven months now and I know it is roughly three short paragraphs (six or seven sentences), whereas 500 words is about a page and half of A4. As an added bonus, once you hone your skills on flash fiction they translate to other areas of your life. Writing a CV/resume? Think of the ‘why you want this job’ bit as the opportunity of flash fiction starring you*. Writing a synopsis of your fictional masterpiece? Flash fiction skills give you the discipline of condensing words into small amounts. Writing a presentation – flash fiction helps you sum up your story in a dynamic way etc etc. *I take no responsibility if you carry out this bit of advice and your employers subsequently decide you have played fast and loose with ‘fiction’.